Sam Werkmeister, 30, sits on his porch in Granite City. Werkmeister is recovering from an addiction to opioids, which began with pain pills taken without a prescription. Sam Werkmeister, a father of two, nearly died six times last year. He started taking pain pills to get through shifts at a restaurant. That led him to a full-blown addiction to opioids. After a relapse last summer, it took Werkmeister six months to gather the courage to go back into treatment. The roommates share a pledge to stay sober as they work to recover from their addictions: alcohol, prescription drugs or heroin. But the continuing budget crisis in Illinois will make that kind of treatment harder to come by as the state's network of providers is strained. As a result, people seeking addiction treatment face longer wait times. Meanwhile, deaths due to opioids are mounting. Madison County, for example, saw 71 deaths due to heroin, prescriptions, or other overdoses in the last year alone. Werkmeister, 30, is tall and soft-spoken, with a brown goatee. He works a 5 a.m. shift at a warehouse in Collinsville. He has been sober for two months. Reaching that milestone was not easy. In his 20s, he tried over and over to quit on his own, gritting his teeth through painful withdrawal symptoms. Finally, in 2013, Werkmeister went to a residential treatment center in Bloomington, Illinois. That 28-day program built the foundation for his recovery, he said. Waiting lists for treatment can run two months or longer, depending on the type of drug a person is using, Werkmeister said. Generally, people have to detox before they qualify for residential treatment. But that waiting period puts them at risk for a relapse. Today, Werkmeister is in an outpatient program, where he gets a shot of Vivitrol to block his cravings every month. The medication is covered by Medicaid. He goes to support groups several times a week. For him, what's most important is that the mother of his children is allowing him to see them again. But the community of people recovering from addiction is tight, and stories of others who don’t get the help they need aren’t hard to find. Werkmeister has an acquaintance who was scheduled for treatment at the Wells Center in Jacksonville, before it announced it might close. His friends haven’t heard from him since. The Arch House, a low-level treatment facility for men staying sober in Granite City, has a waiting list that is six to 10 weeks long. But a third of the center's 21 beds are empty — a pretty common occurrence in Illinois. "Our contract has been cut in the last two years with the state impasse ... we had to cut seven beds in order to stay open," said Raechell Young, the Arch House's executive director. "What saddens me is that the most vulnerable populations are being affected. People who don't have a voice." A spokesperson for the Illinois Department of Human Services disputed that the contract itself had been cut back, but many state contractors are experiencing payment delays. Gordon Anderson, 64, works as an addiction counselor for Chestnut Health Systems. He lived with an alcohol addiction for decades, before getting into treatment. In Granite City, a substance abuse and mental health treatment center called Chestnut Health Systems sits in an industrial park, behind a steel processing plant. On a recent Tuesday afternoon, middle-aged men, teenagers, and moms with their kids packed its waiting room. “When I came to Chestnut, I had maybe three or four or five clients that were addicted to heroin," said Gordon Anderson, who has worked there as a counselor for about seven years. "Today I have, probably close to 80 percent,” Anderson said. Anderson said he now sees a lot of men under the age of 25 coming through the center's doors. But just as the opioid overdose rate really started to escalate, Illinois expanded Medicaid coverage, which pays for addiction treatment. So Chestnut started signing these patients up for health insurance when they walked in the door. That’s now starting to backfire. Illinois’ stop-gap budget expired at the end of last year, and the state isn’t paying companies that manage Medicaid plans in a timely manner. So managed care companies aren’t paying providers, either. The state of Illinois has a current backlog of $12.6 billion in unpaid bills, $2.7 billion of which is due to managed care companies for Medicaid plans since September of last year. Comptroller Susana Mendoza released about $170 million in funds to managed care companies last week, and issued emergency funding to the Wells Center, a Jacksonville addiction treatment provider, in March. Jim Wallis, corporate director of business development and public affairs for Chestnut, said it's one of the lucky ones. When state funding became unreliable, the center sought out federal grants and funding from county mental health boards. But when any provider in the system scales back services, as many do, the need shifts to everyone else. The waiting list for adults, he said, is already pretty long. A Chestnut employee works at the center's crisis unit in Granite City. If Illinois legislators and Gov. Bruce Rauner do not reach an accord by the end of June, the state could enter a third year without a budget. When reached for comment, a spokesperson for Rauner said his office is doing everything it can to ensure that payments are made to addiction providers. But without a budget passed by the state legislature and signed by the governor, Mendoza doesn’t have a whole lot to work with. Debt obligations, pension payments, state employee payroll, court orders and funding for K-12 schools make up about 90 percent of revenue received by her office. She has only has discretionary control over the remaining 10 percent, her office said. This story has been updated to include the Illinois Department of Human Services' comments regarding Arch House's contract. For the past two years Missouri legislators in Jefferson City have sent a strong message to undocumented students in the region: you can go to college in Missouri, but we won’t make it easy. That's what it looks like, at least, to Areli Muñoz Reyes a student St. Louis Community College at Forest Park who started in the fall of 2015. 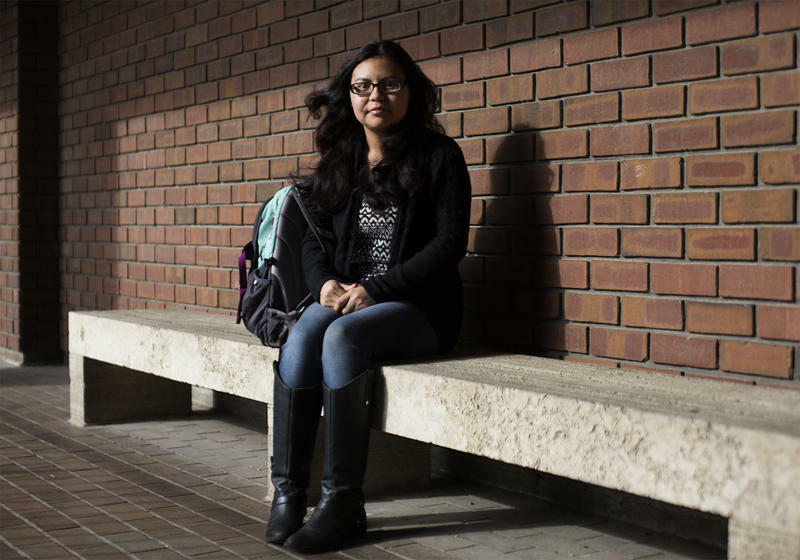 Already worried about what will happen to undocumented students under the administration of Donald Trump, she’s also facing steep tuition rates without the state-funded scholarship she worked hard for.